You know exercise can change your body. Through exercise, one can change parameters such as body composition, endurance capacity, maximal strength, efficiency, etc. The basis behind these changes is that the stress of exercise causes adaptations to occur in the body. The rule of specificity tell us these adaptations are specific to the training stimulus (Hickson). For example, the most effective way to increase a muscle’s maximum strength would be to specifically train that muscle through short-duration, high intensity resistance training, not through prolonged, low resistance repetitive contractions. Conversely, endurance based athletes like marathon runners or long distance cyclists, should train specifically for their endurance events by training over prolonged amounts of time with a lower sustainable resistance or work rate. With this said, how should athletes in events that require a mixture of strength and endurance train? Employing a training regime combining strength and endurance training may yield the best results, but research indicates that for maximum strength gains, the two types of training should not be done in the same session, or even the same day. First, let’s discuss these two types of training. Strength training is generally an activity of short-duration done a very high or maximal intensity. These exercises, such as weight training or plyometrics, increase one’s capacity to do high-intensity, high-resistance work. Some athletes rely more on high-intensity, high-resistance work than others. For example, the general goal of football players, powerlifters, and sprinters is to generate as much force as possible for short periods of time. Following the rule of training specificity, these athletes should train specifically for their respective high intensity event that requires rapid, high-force generation and the best way to do this is by strength training. Through strength training, athletes improve their strength by learning how to recruit, or signal, more motor units. Additionally, those motor units recruited at high thresholds trigger larger, faster, higher force generating fibers. Further, by recruiting more motor units, more fibers are recruited, more fibers contribute to the effort and more force can be generated by the muscle(s). Strength training also results in muscle cell hypertrophy. Hypertrophy is an increase in muscle size or volume. This increases the number of contractile proteins in the muscle cells and enables the muscles to generate more force. At the opposite end of the spectrum, endurance athletes do not rely primarily on high-power movements. Instead an endurance athlete’s performance relies strongly on his aerobic capacity. This is the ability of one’s body to take in and use oxygen. An increase in endurance performance may result from an increase in VO2max, or the maximal rate that oxygen can be taken up and delivered to the muscle cells. Improvements in maximal muscular force generation will not play much of a role in endurance events. Adaptations from endurance training include increased heart stroke volume, increased mitochondrial and capillary density as well as increased aerobic enzyme content in muscle cells. These adaptations directly increase the body’s ability to deliver oxygen and produce ATP aerobically. But what about events in the middle of the strength-endurance exercise continuum? Sports such as short to middle distance running (400m - 5000m), track cycling, and swimming, rely on both strength and endurance adaptations. Logically, one might think that combining the two types of training would yield favorable results; and he would be right to a degree. But recently research has shown that through concurrent strength and endurance training, athletes do not get the same benefits as they would if they separated their strength workouts from their endurance based workouts. One study found that same day, compared to alternate day, training impaired strength development in one repetition leg press tests. The authors of the study found that both the subjects that alternated strength and endurance training and the subjects that did concurrent training sessions increased their one repetition leg press max, but the group that alternated days had a significantly greater increase. The authors offered a few theories that could account for this phenomenon. One theory was that they believed the quality or the volume of the strength training session was reduced following endurance training. The reduction in quality was due to already fatigued muscles. Alternatively, the volume of the strength training session was also reduced when it was done prior to endurance training because the athletes were anticipating a strenuous endurance training session and did not want to fatigue themselves before a long and difficult training bout (Sale et al). Another proposed theory for the inhibition of strength gains through concurrent training is the theory of overtraining. Overtraining occurs when the volume and intensity of an individual's exercise exceeds their recovery capacity. It is generally characterized by a decrease in athletic performance. One study showed strength declined during the ninth and tenth weeks of concurrent training. The author believed the mechanism behind the decrease was overtraining because the participants were training 80 minutes per day (Hickson). Deeply connected with the overtraining theory is the theory of low muscle glycogen. Much like overtraining, low muscle glycogen results from the inability of glycogen stores to replenish themselves from session to session. Chronically low glycogen stores could impair subsequent workouts, especially high intensity exercise. Athletes training more strenuously or frequently are more likely to experience overtraining or glycogen depletion and these states will impair recovery from exercise sessions reducing the favorable adaptations (Nader). Dudley and Djamil found that concurrent training reduced the magnitude of the increase in muscular strength in high-velocity low-force contractions, but did not alter the magnitude of the increase in high-force low-velocity contractions. Previous studies had proven high-speed low-resistance exercises would increase muscle strength at that same high speed. Here, the combination of training negatively affected the said adaptation. This means that concurrent training did not affect low-speed strength, but decreased the favorable adaptation to high-speed contractions. This adaptation would not be favorable to a middle distance, combined strength and endurance athlete because these athletes rely on fast explosive movements. Dudley and Djamil’s proposed theory was that the resistance component of concurrent training negatively affects the adaptation that would normally be seen with high intensity endurance training on a neural level (Dudley, Djamil). But it should be noted this proposal has not been proven and there is little evidence to suggest that endurance training negatively affects recruitment of fast-fatigable motor units (Nader, 2006). Another, and what I find to be the most interesting mechanism behind the incompatibility of concurrent training occurs on a molecular level. Biochemical and genetic based studies have revealed that muscle cells have specific cellular regulatory process that can be induced or hindered by certain forms of exercise. Resistance and endurance training activate different signal pathways that initiate different responses from muscle cells. Studies show that acute resistance exercise activates a signaling pathway that in turn increases protein synthesis (see figure 1). This increase in protein synthesis leads to hypertrophy of muscle cells thus increasing the force they can generate. Conversely, aerobic exercise activates another signal pathway that increases metabolic adaptations favorable to endurance exercise. Endurance exercise stimulates AMPK, an important energy regulator in skeletal muscle (figure 2). Recent studies show that the two signal pathways have antagonistic effects on each other. This means that the activation of AMPK from aerobic exercise inhibits protein synthesis (Nader). Figure 1. Resistance training activates IGF/Calcineurin Pathway which activate mTOR and leading to hypertrophy. Slide from Morris 2012. Figure 2. Decreases in Glycogen, CP, and ATP (from endurance training) activates AMPK and inhibits mTOR - inhibiting hypertrophy. Slide from Morris 2012. There is a number hypotheses as to why concurrent training may result in less than optimal adaptations for strength gains and possibly aerobic efficiency. Regardless of the varying hypotheses, all of the studies have one thing in common: that concurrent strength and endurance training is not as effective as separated training when the goal is improving strength, hypertrophy, or rate of force development. After reviewing this research, it appears that it would be most beneficial for the athletes participating in events that combine strength and endurance components to arrange their workouts into separate sessions. This way they can reap the benefits of both their strength and endurance training. But while there is substantial evidence to suggest that aerobic training inhibits hypertrophy, there is still little evidence demonstrating that endurance training negatively effects motor unit recruitment when done concurrently with strength training. Yes, Dudley and Djamil found that force of high speed contractions was limited -- but this study also recruited 14 untrained college aged women. Hakkinen found that rate of force development was limited, but here again this study recruited a number of untrained women. In the end, I believe the jury is still out on concurrent training. While it may inhibit strength gains from hypertrophy, I still think improvements can be made in the weight room through improved recruitment. Additionally, by recruiting these fast-fatigable motor units and fast twitching fibers again and again -- are they not being trained? Can they not improve their glycolytic and/or aerobic capacities? After all, once the slower muscle fibers become fatigued, won't the faster fibers will be recruited to get the job done? What the evidence tells us: If your goals are hypertrophy and strength gains -- stick to the weight room. If your goal is improved strength, power, and middle/long distance running performance -- perhaps separate sessions (and periodization?) are the way to go. Additionally, there has been much debate over whether distance runners should lift low weight with high repetitions or high weigh twith low repetitions. The bottom line, the heavier the weight, the greater force output required, the more motor units recruited. I leave you with a Flotrack video of Galen Rupp in the weightroom: Rupp WOW Rupp's results speak for themselves. rcise." Journal of Applied Physiology 59.5 (1985): 1446-51. Web. 8 Nov. 2010. <http://rodrigoborges.com/pdf/forca_18.pdf>. Hickson, Robert C. "Interference of Strength Development by Simultaneously Training for Strength and Endurance." European Journal of Applied Physiology 45 (1980): 255-63. Web. 17 Nov. 2010. <http://www.springerlink.com/content/g5462621u3011433/fulltext.pdf>. Nader, Gustavo. "Concurrent Strength and Endurance Training: From Molecules to Men." Medicine & Science in Sports & Exercise 38.11 (2006): 1965-70. Web. 4 Nov. 2010. <http://journals.lww.com/acsm-msse/Fulltext/2006/11000/Concurrent_Strength_and_Endurance_Training__From.13.aspx>. Sale, D.G., et al. "Comparison of two regimens of concurrent strength and endurance training. "Medicine & Science in Sports & Exercise 22.3 (1989): 348-56. Web. 5 Nov. 2010 <http://journals.lww.com/acsm msse/Abstract/1990/06000/Comparison_of_two_regimens_of_concurrent_strength.12.aspx>. I'm taking a step away from exercise performance and physiology this week to talk about another love in my life: Food. I often find myself in the grocery store grabbing the most essential of the essentials: Milk, bread, eggs, meat, cereal... For me, it's usually easy to pick the main entrees for the week -- Say... curry, chicken breasts, chili, steak, pasta, etc. The hardest thing is deciding on what sides items to cook, and remembering what supporting ingredients you need. For those times it helps to have a few things stockpiled in your fridge and pantry. That way, if you forgot an ingredient, you might already have it. And if you don't -- maybe you can still throw something together with those stockpiled ingredients. I think my girlfriend Courtney and I do a pretty good job managing our fridge and pantry. What do we keep on hand? Beans - black, pinto, chickpea, lentils - pair well with rice, decent protein source, good starch, hearty, "musical fruit"
Flour - did somebody say baked goods? Lemons/limes - it just needs something... like lemon! Bell pepper - another versatile vegetable - take 'em roasted, in salad, stir-fry, chili, etc. Heat oil in pan, sautee the bell pepper and carrot together, add garlic, corn, and green peas and sautee 3- 5 minutes over medium heat. 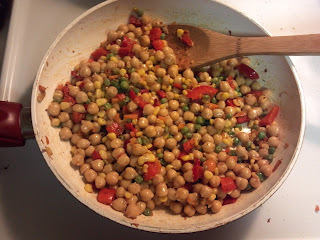 Add chickpeas, lemon juice and season with oregano and cardamom. Salt to taste. I split this into 2 large servings and put it along side some salmon and couscous. All together, it took me about 10 minutes and cost about $2 a serving. Just one example of how a well stocked pantry can keep you healthy, wealthy, and efficient. All right, now that we've briefly covered the basics of lactate metabolism, let’s move on to training for lactate production, transportation and oxidation. Production, of course, refers to the creation of lactate through glycolysis. And remember, to be able to create lactate, glucose must be present (from blood glucose or cleaved from glycogen) to run glycolysis. So to create lactate, an athlete needs to engage in training that relies on glycolysis for ATP production, in turn creating H+ and lactate. Again, lactate is not the molecule we need to buffer or transport out of the cell. It is the H+ that accompanies lactate that disrupts glycolysis and muscle contraction. H+ must be transported out of the muscle cells by monocarboxylate transporters (MCTs). These are H+-Lactate co-transporters, meaning H+ and lactate must be present before they are both pumped out of the cell together into extracellular space. Then the lactate and H+ may diffuse into the bloodstream. Reading the equation from right to left, increasing [H+] in the plasma will consume a proton to create carbonic acid (H2CO3). Applying Le Chatelier's principle, we know that decreasing [CO2] will enable this reaction to proceed to the left. That is one reason why ventilation increases dramatically (ventilatory threshold) near lactate threshold (to purge the blood of CO2 to buffer the H+ created from very high rates of glycolysis). pH is indicated by magenta markers, [Lactate] is indicated by the blue. Notice, the pH threshold in these subjects (240W) falls long after the lactate threshold is met (200W). This further demonstrates that it is not the accumulation of lactate that contributes to acidosis, rather it is H+. Morris did, however, find that pH threshold and lactate threshold are significantly correlated to 20 km time trial performance; meaning, the higher power output at lactate threshold (LT) or pH threshold, the faster the time trial performance. The same can be said for running performance – the faster an athlete can run before lactate accumulates, the faster that athlete will be able to complete a bout – indicating a need for high lactate thresholds, or high work rates with less reliance on glycolysis. To raise an athlete’s LT, training can be approached from a multitude of angles, but two of the most utilized workouts are tempo runs and intervals. Tempo runs or lactate threshold runs are generally done at paces/workrates just slower than or equivalent to LT – often referred to as maximal lactate steady state (MLSS), or just LT. Sometimes you will hear coaches talk about anaerobic lactate threshold runs - these are just sustained 10-20:00 runs done just above lactate threshold pace. Training at paces/workrates greater than LT – also called supramaximal or intensive intervals are shorter bouts of higher intensity training separated by bouts of recovery. An example of the first workout is a steady 40:00-60:00 @ LT pace, whereas an example of a supramaximal session would be something like 8-12 x 1:00-3:00 at >100% LT with 1:00-3:00 recovery. Physiologically, the responses to the two workouts are very different from one another – blood lactate concentration during the 40:00-60:00 LT run may remain relatively constant between 3 – 6 mmol/L, whereas lactate values during the supramaximal intervals may be as high as 20+ mmol/L. Looking at these values, one might assume that “more is better” and supramaximal intervals must stress the system more because they invoke higher lactate values. But consider the time of the bouts – keeping in mind recoveries after the shorter supramaximal intervals. While the shorter intensive intervals may cause higher spikes in blood lactate, they are short lived. And by completing extensive intervals or steady runs near LT, blood lactate concentrations will remain relatively low, but over a longer period of time. So, which will make you faster? Arguably, both. But which is best? Well, it depends. Graph 96, from Peter Janssen’s book Lactate Threshold Training, demonstrates lactate responses to the respective types of training. Admittedly, this graph is a bit over simplified – but it gets the point across. Intensive (supramaximal) intervals elicit high [lactate] but can only last so long (1:00 - 3:00). Whereas longer extensive repetitions (3:00 - 10:00) elicit lower [lactate], but an athlete can sustain them over longer period of time. And finally, intensive endurance (MLSS, marathon pace) runs elicits even lower [lactate], but can be sustained for a substantially longer period of time (20:00 - 60:00). Training to maximize lactate threshold or pH threshold is no easy task. There are multiple ways to approach the issue when it comes to types of workouts and timing of workouts in preparation for a season or championship race. First, a coach or athlete must recognize the specific demands of the goal race because specificity is important when choosing the types of workouts an athlete should run. A 1500m is much different in terms of energy demands from a half marathon. Lactate values during a 4:00 1500m may reach >15 mmol/L whereas lactate values during a 65:00 half marathon may be closer to 4-6 mmol/L. And since lactate threshold has been found to be closely correlated with pH threshold (Morris and Shafer, 2010), it’s safe to assume that intramuscular/plasma pH falls lower during 1500m running than it does during a half marathon. In this review, Cairns demonstrates that short high intensity exercises do indeed elicit the greatest decrease in muscle pH. The lowest values found here were after 20 minutes of 30-40s repeated sprints, and during maximal exercise lasting from 1.5 to 11 minutes. Unfortunately, I cannot access reference 21 to look up the repeated sprint exercise protocol. It’s nothing profound, but this data indicates that these exercises best mimic the demands of the 1500m run – and a 1500m runner would be wise to run intervals of 30s to 11 minutes. But wait, 11 minutes? That’s a long interval. And remember, these were maximal efforts – running a workout consisting of multiple 11 minute intervals at a maximal effort just isn’t feasible. That’s because a drop in pH (acidosis) inhibits glycolysis, inhibiting ATP production in subsequent bouts. Therefore, a 1500m runner is better off completing 2 sets of 6-8 x 60s with 60-75s recovery and 3:00-4:00 active recovery between sets. By incorporating active recovery into the workout, lactate is transported out of the glycolytic muscle cells along with those hydrogen ions (by the MCT co-transporters). The H+ ions will be buffered by bicarbonate, and lactate can either be transported to the liver to be converted back into glucose, or transported by MCT1 into oxidative (slower twitching) muscle fibers and utilized for ATP production in the Krebs cycle and then oxidative phosphorylation. So, what you see with recovery is a decrease in lactate, and increase or maintenance of intramuscular/plasma pH. Because intramuscular pH is maintained with adequate recovery, glycolysis is not inhibited and the athlete can complete more work: more sets or reps. In this case, instead of completing 11 minutes in one bout, the athlete can complete 12-16 minutes of work at or near the same workrate or pace. As for completing longer 40+ minute LT runs - I do not believe these are appropriate for 800/1500m runners because they are not specific in terms of pace or energy demands. No, 40:00 LT runs should not be difficult for 1500m runners, but that does not mean they should do them. Running 40:00 at a pace near LT, you get relatively low lactate values (maybe 4-6 mmol/L) - which do not replicate the >10 mmol/L that will be seen during 1500m running. Additionally, during the relatively prolonged slower pace 40:00 run, the athlete will not be recruiting the faster twitching glycolytic fibers to the same degree that will be called upon during a 1500m race. This is not to say that 1500m runners should never complete 20-40 minute LT runs. But these types of workouts should be saved for recovery cycles, or early introductory periods. The same goes for cyclists – except cyclists can generally complete more extensive workouts than runners because of the absence of eccentric muscle contractions. Not only can you get more work out of your workouts with adequate recovery, but the recovery can also train the MCT co-transporters and slower twitching muscle fibers. Because high intensity exercise creates large amounts of lactate, it will also increase the number of MCT4 co-transporters so that more lactate and H+ can be transported out of the glycolytic fibers. Further, high intensity exercise has also been shown to increase MCT1 (Juel and Halestrap, 1999). MCT1 transports lactate and H+ into slower twitching oxidative muscle fibers. Here, lactate dehydrogenase can convert lactate back into pyruvate to be converted to acetyl Co-A and oxidized it in the krebs cycle. So in a way, your slow twitching fibers become hydrogen buffers and lactate "recyclers." But what about our half marathoner? The guy running for 65:00 at roughly lactate threshold. Could he also benefit from high intensity intervals? You bet! By increasing lactate and H+ clearance from glycolytic fibers, they’ll be able to function at a higher capacity for a longer period of time. Additionally, by increasing the number MCT1 co-transporters, he’ll be better able to buffer H+ and use it and lactate as fuel in his slower twitching oxidative fibers. But, with that said it is still important to keep event specificity in mind. High intensity intervals are not the be-all and end-all. A 65:00 half marathoner likely does, and should do high intensity interval training, but he may do them less frequently than the 800m, 1500m, or 5000m runner. Additionally, his intervals should be longer and slower than those of the 1500m runner to emphasize specificity. A main-set for this half marathoner may be 5-6 x 2k at 100-105% LT (5:00 – 4:45/mile) with 60-120 sec. recovery. The recovery to work ratio here does not need to be as high as it would be for the 1500m running his workout because running within 5% of LT should not cause an accumulation of H+ that would inhibit glycolysis. I’ve mentioned a couple of examples of workouts for middle and long distance runners, but through the course of a season or build to an important race we don’t want to have the athlete complete the same workout again and again. I believe the athlete needs some variety, and a change in training stimulus to continue to improve. And it can get complicated when developing a training plan – depending on whose coaching methodology you follow, or what you believe in terms of periodization and progression. A number of coaches (Jack Daniels, David Morris, Brad Hudson, Joe Friel, and Arthur Lydiard) prescribe shorter, higher intensity bouts early to midway through in the training phase – even for the marathon runner or long distance cyclist. These short high intensity intervals can work to raise LT by increasing the number of MCT co-transporters while potentially building strength and improving recruitment through faster running. These high intensity interval workouts are not high in volume so that the short intensive interval sessions can also serve as primers for longer more extensive workouts. After completing 6-8 weeks of training with a mix of high intensity intervals when our half marathoner goes to run his steady 40:00-60:00 LT run or 3-4 x 2 mile interval workout, he can actually maintain a higher pace (and still be running at LT) than he would if he had not completed the intensive training early in the training period because he can transport, buffer H+ and utilize lactate. Late in the training phase, half marathoners and marathoners should incorporate more and more of the pure LT running with 40:00 - 60:00 @ LT or long broken LT intervals because they are more specific to their respective events. And that's about all I have to say about that. I'm sure I'll think of something I left out later. Cairns Simon P. Lactic Acid and Exercise Performance Culprit or Friend? Sports Med 2006. Janssen, Peter. Lactate Threshold Training. 2001. Human Kinetics.